We found this as a request for research on OpenAI. Though it sounded simple enough, it had been an open issue for quite a long time. One of the main reasons behind choosing this particular project was that Skcript had been working with NLP for a long time now and had a lot of experience building chatbots. While I discussed this idea with Swaathi, even she was excited to work on this! Later I would understand that there were a few projects lined up for me to work on, and this was done to increase my ability to initiate and take up work. My primary area of interest is Computer Vision, it’s a very interesting and a fast evolving field. One other reason that I was working on the Joke Bot was to improve my understanding of NLP. When I started my internship, my mentor Naveen was on vacation, so on his return he also appreciated my intent to create the Joke bot. Then after the first week, I started to work on the project that was actually lined up for me. It was a live client’s project that was supposed to be production grade. Assigning this project to me truly resonates with what our beloved CEO, Karthik told us in the orientation. He wanted us to have the best experience and learning something which we normally wouldn’t have. I have previously worked on multiple projects, but none of them were at a truly production level. This trust, pushed me to work better and also importantly improve the quality of my work. At the same time, Naveen had the foresight for the company that we needed to start advancing in the field of Computer Vision as well. We wanted to create an object detector that could be trained easily and customized to various needs. The first and the foremost was to do a literature review, since deep learning is evolving at a very fast pace, the best way to be informed about all the advances is arxiv.org and of course good old Twitter. We wanted to build a real time model that could detect objects in real time while not being computationally heavy. After some digging, Yolo9000 (No, I’m not making the name up) seemed like a good choice for the task. Then, while actually using the algorithm we realized that it takes too long to train even with considerable computation power. 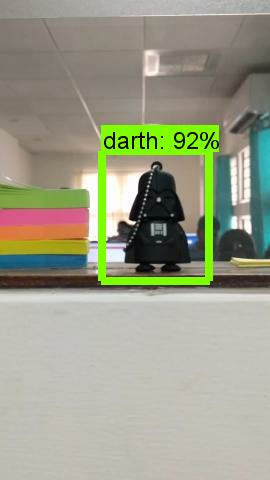 This is when the new Tensorflow Object Detection API was released. This was a godsend from the Google research team. The API is amazing to retrain models to your specifications. We made a Darth Vader detector with it! The best thing about Skcript is that everyone is always looking for work, the level of initiative taken up by each member is just staggering - everyone is looking for new avenues for the company to grow while being consistent about their current work. With a heavy intent to give back to the community, we write about anything from our experience that could potentially benefit even a single person. This intention helps us write some blogs on very specific use cases that are normally not found.